We only had 5 students compete at the Alton edition of the Vision Championships but still came away with 3 silvers and 2 bronzes. 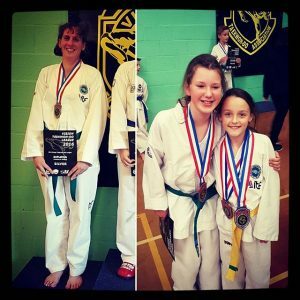 Well done to Rosie Grove (silver in special technique and bronze in sparring), Matilda Grove (bronze in sparring) and Donna Rye (silver in sparring and silver in power test). Unfortunately Tunbridge Wells dropped from 3rd (after the first competition) to 5th in the overall school standings. Hopefully next year we can topple the big clubs around us. This entry was posted in Uncategorized on 05/10/2016 by Mr T.